The assured texture and subtle pattern of our Woven Vinyl flooring, now has wider scope to bring a mature and sophisticated look to commercial interiors thanks to two brand new designs. FAIR is a timeless and honest linen-like texture that is sure to look natural in any setting, its 15-strong colour palette full of organic tones. In fact, despite a machine-woven super-strong PVC yarn, Fair looks unprocessed, a raw texture less-often found in commercial rated flooring and particularly in one so tough. 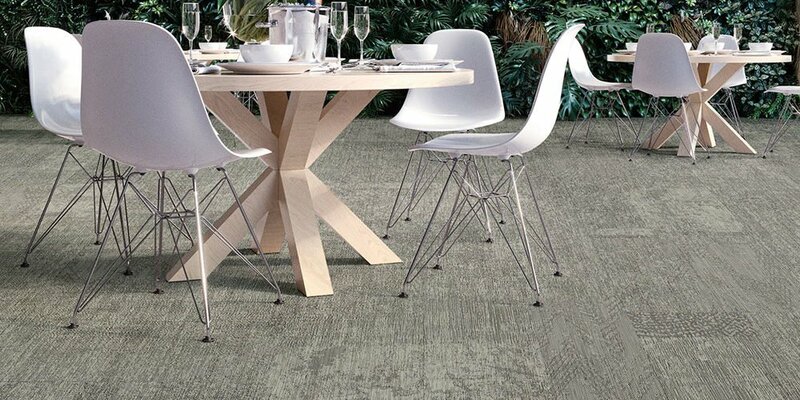 WILD has a more expressive approach, combining a variety of large-scale organic textures into a single design that demonstrates how woven vinyl flooring can at once be adventurous and refined. In four modern tones, this ntgrate design works brilliantly in tile or sheet. Eminently cool and incredibly capable, our woven vinyl flooring makes a great choice in all areas of workplaces. Whether corridor, workspace, boardroom or breakout; it gives an aesthetic that’s still new and unusual, helping projects to stand out from conventional carpet tile or vinyl planks. Of course, it can work alongside other flooring materials too, where its versatility can truly come into play.